My life has changed so much in the past four years at UT. I was able to contribute to research through the Freshman Research Initiative (FRI). I did the unimaginable and biked across North America with Texas 4000 for Cancer. I lost one of the most important people in my life to cancer, and, at the same time, I gained countless life-long relationships—indirectly through cancer. When I found out my dad’s health was declining, I was waiting for my turn at the bench designated for phage dilution in my FRI Supramolecular Sensors lab. My dad had been fighting lymphoma for about 15 months then, so when I had received a phone call from my aunt telling me he had pneumonia, my heart sank. I felt lost, and I was unsure about what I needed to do. I summed up everything that just happened as best as I could to Dr. Ghanem, our stream’s research educator, and she took the reigns into her own hands. She contacted all the people necessary for my withdrawal from UT, and she comforted me. Dr. Ghanem gave me the warmest hug I had ever received. That hug alone gave me reassurance that things would be okay. Two weeks after I left UT, my father passed away. I spent the remainder of that spring and summer with my family trying to fill the void left in my heart with my dad’s passing. Amongst all of the chaos, what really kept me grounded was keeping in contact with Dr. Ghanem and my Texas 4000 teammates. They selflessly gave me their shoulders to lean on and sent me messages of condolence, hope, and kindness. In the fall, Dr. Ghanem welcomed me back into our stream with no conditions and assigned us into groups—Ellen and I were in that same group. It wasn’t until that fall semester that Ellen and I really cultivated a friendship. We had met in the spring during our first year at UT, but we were on different schedules. Through all the hours of questioning “wait, what are we even doing?”, “what could this NMR spectra possibly mean?”, and “what even is NMR?”, Ellen and I became close. Eventually, I talked to Ellen about how much I was in love with Texas 4000 and how she should really consider joining. I didn’t know much about Ellen’s ties with cancer, but I knew that she would be a phenomenal teammate. As soon as Ellen had let me know that she applied and was accepted into Texas 4000, I was ecstatic—both for her and her future teammates. Ellen is hardworking, diligent, kind, and dependable. When I decided to shave my head in solidarity with pediatric cancer patients that following spring semester, Ellen was there to cheer me on. During my summer ride in 2013 with Texas 4000, she sent me words of encouragement and motivated me to push my pedals harder. As part of the 2014 team, Ellen ended up raising over twenty grand on her own and became an integral member of her team. This past summer, I was able to relive the Texas 4000 experience vicariously through Ellen. FRI and Texas 4000 are more than just a research stream or a student organization. They are my family. My undergraduate experience would not have been the same without the incredible individuals that make up each group. I look up to them so much and have learned so many valuable life lessons from them. Dr. Ghanem, Ellen, and Texas 4000 all have helped me to grow as a person and have inspired me to be the best version of myself I can be. They don’t know this, but they were my therapy when I needed it most—my way to healing. I met Cindy when we were both placed into the Supramolecular Sensors (SMS) Stream during our second semester in the Freshman Research Initiative program. Learning every detail about our new lab sometimes seemed overwhelming. I remember spending hours in the SMS lab each week learning how to run reflux reactions, use the spectrophotometer, make unique chemical sensors, and perform other basic organic chemistry analyses that, at the time, seemed over my head. Research can be frustrating, but it was also made so much fun by the people I was surrounded with in the lab. I made friendships that I know will last a lifetime. Cindy was one such friend. Not only was she an encouraging presence in the lab, she also inspired me to take on something that I never thought I would be able to do. Cindy lost her father to cancer, and she was compelled to do something about it. She decided to embark on a charity bike trip called Texas 4000 – a ride starting in Austin, TX, right here on the UT campus, and ending in Anchorage, Alaska. I was so curious about Cindy’s ride. I began asking every question I could about it. How much money do you raise? She said each rider raises $4,500 at a minimum. Who can do the ride? She told me anyone who is a UT student – undergrad, masters, or doctoral! Where does the money go? She said to cancer research and support programs at M.D. Anderson and the UT Biomedical Engineering Program. Talking to Cindy about Texas 4000 prompted me to reflect on my own experience with cancer. Unfortunately, cancer affects almost everyone…including me. I lost Mimi, my maternal grandmother, to a rare blood cancer called Multiple Myeloma when I was in the sixth grade. Shortly after that, I lost my Papa, my maternal grandfather, to lung cancer. Over the summer of 2012, my Uncle Kevin was diagnosed with prostate cancer. And finally, my junior year, my mom was diagnosed with skin cancer. Enough was enough. Cindy challenged me to do something about it. 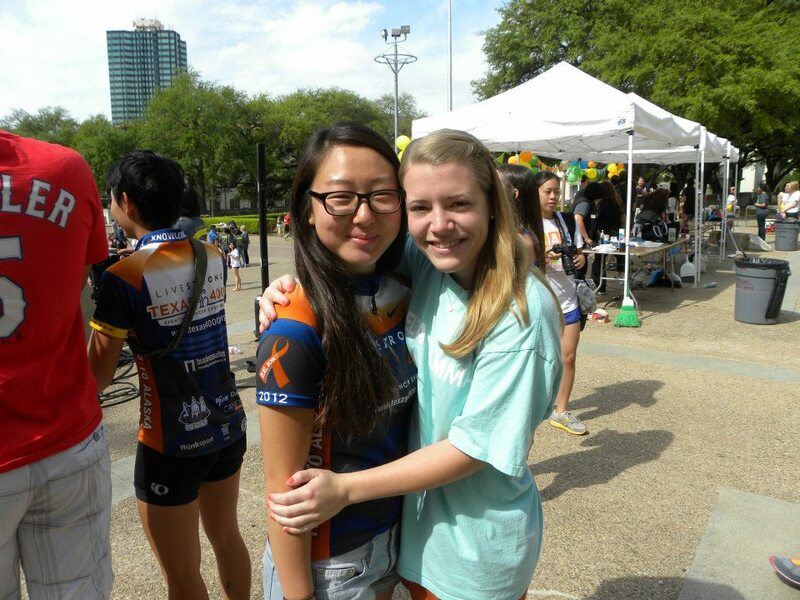 She encouraged me to apply for the 2014 Texas 4000 team, and it was the best decision I made during my college career. Over the next two years, Cindy and I became closer as we bonded over our shared pain of losing loved ones at the hands of this awful disease. I watched Cindy become a great cyclist, as she trained for months in preparation for her ride. Over the summer of 2013, I watched her progress along her journey on social media and eagerly awaited her Snap Chats and texts, from their various stops along the Rockies route. Soon enough, it was my turn to train for my ride. Cindy was there for me through it all – sending me sweet messages of encouragement and sharing tips along the way. This past summer, I rode the Sierra route from Austin to Alaska along the west coast. I met many people who were affected by cancer and carried their stories along with me. It was an honor to ride not only for my loved ones, but also for others whose lives had been touched by cancer. It feels like everything has come full circle. Cindy and I met doing research in the SMS lab in the FRI program. Now, after the completion of both of our rides, together we raised over $30,000 for cancer research. Still, our friendship doesn’t stop here. Next year, Cindy and I will both be attending medical school, and I can’t wait to see what type of physicians we will become in the next phase of our lives.